Gordon Cheung is a contemporary artist whose work captures the mood of the global collapse of civilization – or a dystopian, prophetic vision of it – where moral, economic and environmental crises have spun out of control. Spiritual undertones are balanced alongside familiar contemporary images including sources from popular media, cyberspace, nature, and more recently, from historical painting. This solo exhibition, generously supported by Edel Assanti, London and Alan Cristea Gallery, London will feature new large-scale paintings, animations and digital works made especially for Nottingham Castle and shown here for the first time. Here be Dragons is a reference to cartographical ‘Unknown Lands’, meaning dangerous or unexplored territories. For Cheung, it frames the geopolitical situation in the South China Sea where new territorial lines are being contested and redrawn. 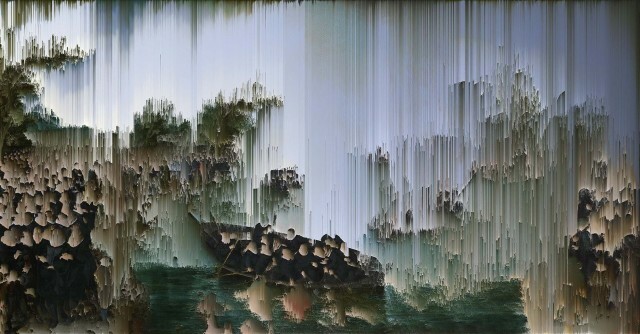 It is also a phrase that is also used by computer programmers to caution a region of code that is complex, informing the ‘glitch’ (New Order) digital works that are based on 17th century Dutch painting and traditional Chinese Ink painting, including works drawn from the Castle’s own collection. The exhibition explores the birth of the first multinational company and Modern Capitalism in the Dutch Golden Age as it stretches through history intersecting trade routes, culture and colonisation to the rise of China with Authoritarian Capitalism. A fully illustrated catalogue published on Saturday 11 June 2016 by Nottingham City Museums & Galleries with texts by Tristram Aver and John-Paul Stonard will accompany this exhibition. This exhibition is has been supported by Edel Assanti, London, and is part of the Grand Tour season 2 programme. The Grand Tour reinterprets world class collections through contemporary art at four venues in Nottinghamshire and Derbyshire, with a fringe programme at other leading venues across the two regions. Season two, 17 March – 26 June 2016.